Happy New Year! I hope that everyone enjoyed their weekends as much as I did. On Friday night, we went to a party in Brooklyn, which was a lot of fun and not too crazy, which is precisely what I had in mind for New Year’s Eve. We didn’t stay out too late; we got home around 2:30 AM and immediately went to sleep. Our friend Morgan stayed the night, and in the morning, we all woke up and watched The Office bloopers while I made pancakes (the recipe is soon to follow – it was my first time making these particular pancakes and they are fantastic). That evening, Kramer and I just stayed in, steered clear of alcohol (I definitely needed a break), made dinner, and watched a few movies, one of which was The Pixar Story. It was basically just a history of computer animation and how important Pixar was throughout all of it. I’m normally not a big fan of animation, but I loved this documentary and it was really interesting to see how essential Pixar was, and still is, to the field as a whole. On Sunday, we celebrated our 1st anniversary as a married couple. We made it! I can’t believe it’s already been an entire year. It feels like a few months. We woke up and immediately popped open some bubbly to enjoy while we watched some classic Simpsons episodes, then went over to Back Forty for a delicious brunch and some very tasty cask beer. We took the rest of the day to catch up on Oscar-bait movies; we saw The Fighter and True Grit. I adored The Fighter. I really didn’t think that I would like it as much as I did, but Christian Bale’s performance just blew me away. He stole the movie, and if he doesn’t win an Oscar for Best Supporting Actor, I won’t know what to think. I liked True Grit, too, I guess that I was too excited for it, and therefore expected too much from it. I always have that problem. Jeff Bridges did a fantastic job, as did Hailee Steinfeld, who played 14-year-old Mattie Ross. I think she’s definitely in the running for a Best Actress win; she carried that movie all on her own, which is incredible considering she really is 14 years old. The only problem with True Grit versus The Fighter was that I cared so much more about the characters in The Fighter, whereas True Grit didn’t give me enough background on anyone for me to be as attached to the characters, despite the fantastic job all of the actors in the film did. Anyway, enough about all of the movies I’ve been watching. On to pizza, right? We actually made these on Christmas Eve, instead of doing another big feast like we did on Thanksgiving. It was a lot of fun, as we’ve only made pizzas together one time before, and this time, we really tried to do it the right way. Kramer found a great piece about how to make as-authentic-as-possible Neapolitan pizza, so we followed those directions as closely as possible. The key is to get your cast iron pan as hot as possible in a pre-heated oven, then place the dough directly into it with some cornmeal, place your toppings on the dough, and put it under the broiler for about 5 minutes. After that, you want to turn your stove up to as high as it can go, and cook the pizza there for another 5 minutes, to make the crust crispy. It might take a bit of coordination, but it’s worth it, because these pizzas were phenomenal. The crust was tender on the inside, but crusty and just ever-so-slightly charred on the outside. The sauce we used had just a bit of anchovy paste in it, as a “secret” ingredient that really added a nice depth to the pizza. We used a combination of mozzarella and Parmesan cheese on top, and we each chose different topping ingredients. Kramer used the two cheese, some nice green olives, some sweet sopressata, and diced tomatoes. I chose to be a bit more simple, topping my pizza with only the two cheeses, tomatoes, and fresh basil. Each pizza was amazing and it took everything we had to save two slices for breakfast the next morning, which were devoured as soon as we woke up. You can, of course, use any sauce and any toppings that you want, but I highly recommend this pizza dough recipe and the technique that follows, because it’s the best homemade pizza that you’ll ever make. That’s all you’ll need for your crust ingredients! I made my dough in my bread machine, but you can also knead it with your hands. Instructions for both methods may be found below. After you’ve kneaded your dough and it has risen, divide it into 2 balls and store in airtight containers, either on the counter for 3 hours or so, or in the fridge overnight. 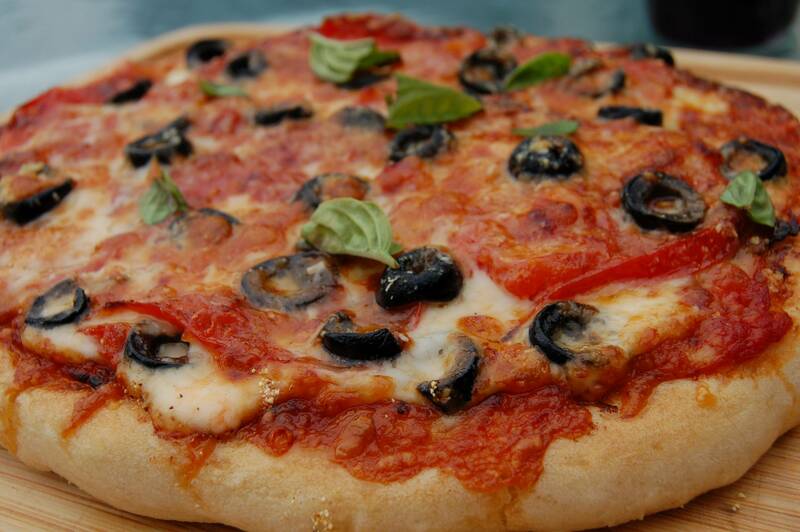 Before cooking your pizza, though, allow your dough to come to room temperature before cooking. I made my sauce before getting my pizzas ready to go. This just makes for less mess and more organization. For some reason, I forgot to take a photo of my anchovy paste along with everything else. It’s the secret ingredient! Saute your shallots in olive oil, then add in the garlic and give it a stir, cooking for only a minute or so. Add in the rest of your sauce ingredients, bring to a simmer over medium heat, and cook for 5-10 minutes, until thickened, stirring frequently. Remove from heat and set aside. When you are ready to make your pizza, set your oven to broil and place your cast iron pan(s) in the oven to heat up. Lightly flour your work surface and your hands and begin to spread the dough out into a circle. Continue working very gently until your dough is a 10-12 inch circle. Sprinkle your cast iron pan with some cornmeal. My husband put cubed mozzarella on his pizza, but I used shredded mozzarella. Place your dough in your heated pan and spread about 1/4 cup of sauce over the dough. Add meat, then cheese (this is my pizza with shredded mozzarella and no meat). You can see that my husband added sopressata under the cheese, so that it didn’t burn. Cook under the broiler for no more than 5 minutes, until bubbling. Then cook on the stove, over high heat, until the bottom of the crust is just slightly charred. Remove from the pan and allow to cool for a few minutes before slicing. Be sure to “like” me on Facebook so you can keep updated on all of my new recipes for 2011! Whisk together the flour and salt and add to your bread machine. Add the yeast and the sugar to the warm water and stir until they dissolve. Add this to your flour mixture. Set your bread machine to the "dough" cycle. This should put your dough through 4 cycles: 1 kneading, 1 rising, 1 kneading, and 1 rising. Whisk together your flour and salt and set aside. Dissolve the yeast and sugar in the warm water. Carefully mix in your flour, about ½ cup at a time, until smooth. The ball will be sticky, but firm enough to form into a ball. Lightly flour your hands and your work surface. Place the dough onto the work surface and begin to knead by form the dough into a ball and continuously pulling the dough over itself, like you were trying to work food coloring evenly into the dough. You want to keep stretching the dough and then pushing it back into itself, using your palms as much as possible and work as quickly as possible. Add a small dusting of flour as needed. Knead your dough continuously for 15 minutes. When your dough is ready, allow it to proof for 1-2 hours, either in the bread machine or in a bowl covered with a warm, slightly damp cloth. After that, separate the dough into 2 balls and place in an airtight container, be it a sealable bag or a Tupperware container. I like to use Tupperware to allow the dough some room to grow. I left mine on the counter at room temperature for about 3 hours, but if you can let it go overnight in the fridge, that's for the best. If you let it sit overnight, pull the dough from the fridge about an hour before you want to use it to bring it to room temperature. When you are ready to make your pizza, lightly flour your work surface and place one ball of dough onto it. Carefully stretch the dough out with your palms and fingertips, working with it until you can get your knuckles under the dough and work it out into a 10-12 inch circle. Makes enough for 2 pizza crusts. Heat your olive oil in a medium pot over medium heat. Add in the shallot and saute for 5-8 minutes, until soft and translucent. Add in the garlic and cook for 1 minutes or so, just until fragrant. Add in the remaining ingredients, stir, and bring to a simmer over medium heat and cook for 5-10 minutes, until thickened, stirring frequently. Taste and adjust seasonings as needed. Makes enough sauce for 3 10-12 inch pizzas. Place your cast iron pan(s) in your oven and pre-heat it to the highest setting (or broil). You want your pans to be nice and hot when you put the crust in them. When your pans are hot, sprinkle them with some corn meal (about ½-1 teaspoon) and stretch your pizza dough into 10-12 inch circle using the methods described above. Place the dough into your cornmeal dusted pan, and spread about ¼ cup of pizza sauce over the dough (more or less, depending on how much sauce you like). If you are topping your pizza with meat, I suggest placing the meat under the cheese so it doesn't burn. Kramer made his pizza with sopressata, so he put slices of that directly on top of the sauce. After your meats (if you're using them), top your pizza with ¾ cup of mozzarella cheese and ¾ cup of Parmesan cheese (more or less, depending on how much cheese you like). After the cheese, add your vegetables, like olives, tomatoes, or mushrooms. DO NOT ADD FRESH HERBS. You want to add your fresh herbs after the pizza comes out from under the broiler, otherwise you will have some burned herbs on your pizza. Place the pizza under the broiler and cook for no more than 5 minutes, keeping an eye on it and pulling it out a bit early if necessary. Now, turn on your stove top to high heat and place your pan on top. If you want to add fresh herbs to your pizza, this is the time. Cook for another 5 minutes or so, until the bottom is crisp and slightly charred. Remove from the pan and allow to set for a minute or two before slicing and devouring. I never would have thought to make pizza that way! I’ll be saving this:-) Sounds like a wonderful New Year’s Eve. Lauren: Thank you very much! I hope you had a great NYE, too! I am so excited to see this! It looks amazing, I love homemade pizza! I’ll be trying this on the weekend! @Dena: Thank you and Happy New Year to you, too! Let me know how your pizza adventure goes! @Nikki: I just got mine, so it’s fun to play around with it! I’m always looking for ways to use my cast iron skillet. Never thought of pizza! Thanks!! Wow, that looks fantastic! I wish we had a cast iron skillet!! Tiffany: You can really use any oven-proof pan, I just think a cast iron makes it extra special! Oh wow, this pizza looks out of this world! I will definately have to try this one out next time I make pizza. @Darcy: Thank you very much! I hope you come back often! @Megan: Same here! There’s never a bad time for pizza! I’m so hungry for pizza now! I’m pretty much always hungry for pizza though. My boyfriend is already harassing me to try this one out! @Frankie: I hope that you give in! @Jen: Sounds like a great mother-daughter bonding opportunity! @Juliana: Happy New Year to you, too! Strangely enough my mom said we should make our own pizza soon. Excelllllllent. 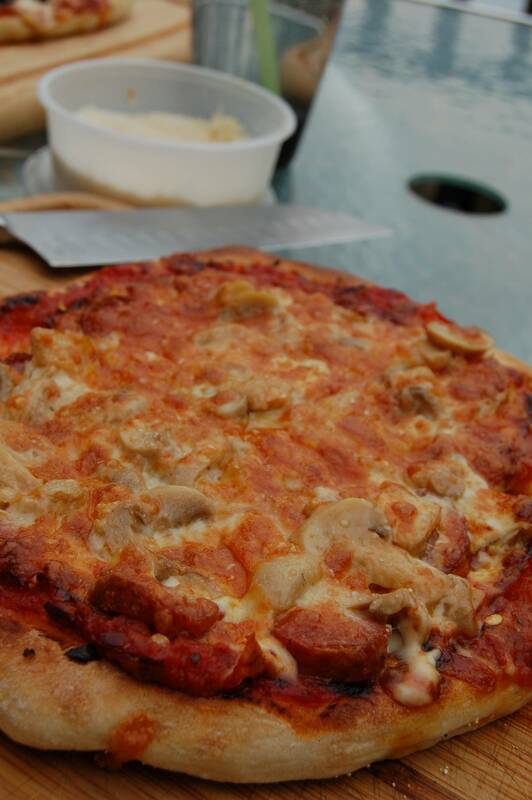 Wow, cast iron pan pizza, it sure looks great…what a great way to make pizza…love the brown crust…so yummie! HAppy 2011! Hmmm…is it too early to make pizza? It’s gotta be lunchtime somewhere. Any suggestions on where to find a great cast iron skillet?! Julie: My husband got me this one: http://www.amazon.com/Lodge-L10SK3-12-Inch-Pre-Seasoned-Skillet/dp/B00006JSUB/ref=sr_1_2?ie=UTF8&qid=1294154070&sr=8-2. It’s great because it’s already seasoned! Ooo la la. I know what’s for dinner. Already canned homemade sauce last summer so that part is done. Anchovy paste though? What the dealie with that? If I don’t like anchovies would I still like this in my sauce? Interesting… this looks great. Better get busy on the dough! Handful: You honestly wouldn’t even know it was there; it just adds some depth and a nice, salty (but not overwhelmingly so) flavor. I highly recommend trying it out! It’s not a lot in the grand scheme of things. I hope you try it out! Man, this looks amazing. Does it require a cast-iron skillet, or will any skillet do? @Aeva: Thank you! You can use any oven-proof skillet, I just highly recommend the cast iron. Happy pizza making! @Miss: Thank you very much! The best of luck to you in your crispy-crust endeavors! @Jenn: Thanks! My husband just got it for me and we had to put it to good use! I can never get my pizza crust crisp and I don’t know why I never thought of the cast iron, I use it for everything else, it’s what makes my cornbread crunchy for pete’s sake. Wonderful post! Beautiful pictures and congrats on your anniversary! Happy Anniversary Sydney! 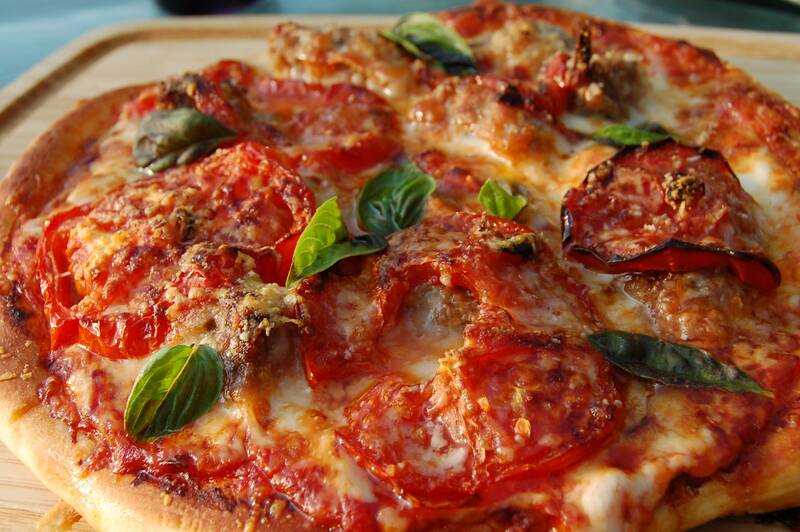 That first pizza looks delish, what a great idea to do it ina castiron skillet! Dana: What a great gift. My husband gave me mine for my birthday, which is just before Christmas. We can break in our new pans together! This pizza is AMAZING. I showed my fiance the recipe and he couldn’t wait to try it out. We made it and not only was it delicious, but the great thing about it was that we could let people top their own and then just throw it in the oven. It was so easy and delicious! Thanks for another awesome recipe! Taylor: Thank you so much – I want to do a pizza party like that, it sounds like so much fun! Great recipe! I’ve made these twice by hand but wanted to try using the breadmaker today… I noticed the directions say to stir in the oil but there’s no oil in the ingredients. Did you mean sugar there? April: Yes, I’m sorry about that! Your pizzas looks amazing – I’m getting hungry just looking at them! Oh, wow. Two thumbs up! I made this for dinner tonight and I’m wishing I made more than two pizzas. I am a really bad cook, but these came out so much better than I could have imagined. My kitchen is a flour-y mess right now but totally worth it. I’m going to have to find some anchovy paste for next time. Thanks!! @Riki: My husband will be very happy to hear this!